04 Apr 52 Short Love Notes to Romance Your Wife With! Are you looking for inspiration for writing short love notes? Are you looking for help expressing romance to your loved one? Take a moment to read this sample note. I’m so proud of us; our friendship, the kindness we share between us, and the small sacrifices we make for one another that secretly mean the world to us. I’m so grateful to have found you, to be privileged to share this life with you. You are the sum and source of my joy. My name is Josh Gordon and I wrote a short love note to my wife for every week of the year! My wife felt valued, appreciated, and special when she received them. We both believe that every couple should exchange sweet messages that are as uplifting and encouraging as the ones we share with each other. Sarah and I decided to put the 52 mini-loveletters into an e-book with the goal of inspiring other couples to romance. We suggest taking the letters in this e-book and adjusting or modifying them to fit your specific needs. Or use some special stationery you’ve purchased specifically for romantic love letters! The key is to take your loved one by surprise! Short love notes left in inconspicuous places for your hubby or lovely wife to find can be amazingly romantic. Order your copy of the 52 Love Notes to My Wife now. When your purchase is done, you’ll have immediate access to the 56 page downloadable e-book so you can begin surprising your wife with written romantic expressions today! The e-book is in the Adobe PDF file format. If your computer doesn’t have the Adobe Reader software, you can easily install it for free. Just click here to download the free software. Sarah and I want this resource to be something that you’re blown away by! We are confident that it will inspire and motivate you to be a better husband, wife, or partner. In fact, if you’re not happy with this collection of short letters – or even if you’re marginally satisfied, we’ll completely refund your cost, no questions asked, no small print, no strings attached. 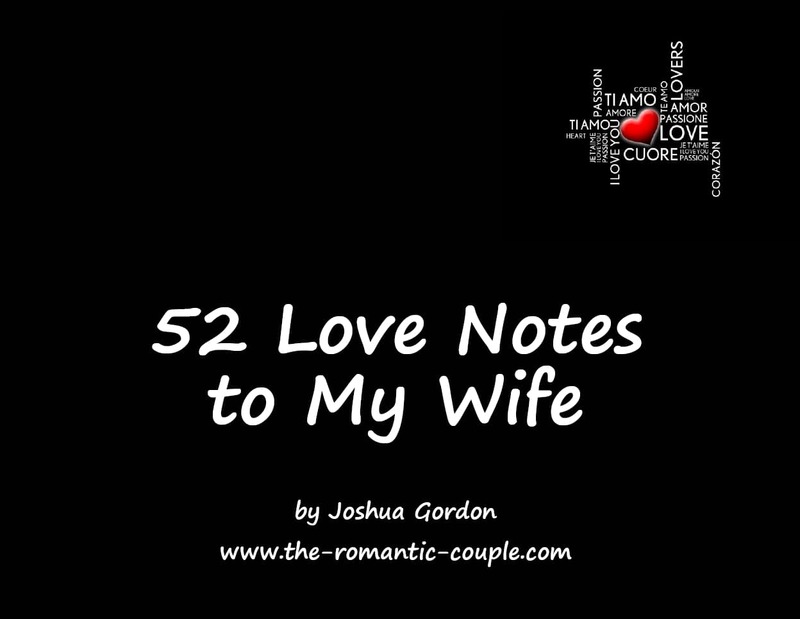 Purchase 52 Love Notes to My Wife and turn up the heat in your relationship! Become a truly romantic couple!